Les créations de Katwondoo: Party time! I made another shaker card, using the same technique as yesterday, recycling a coca-cola box and a plastic packaging instead of using an acetate. 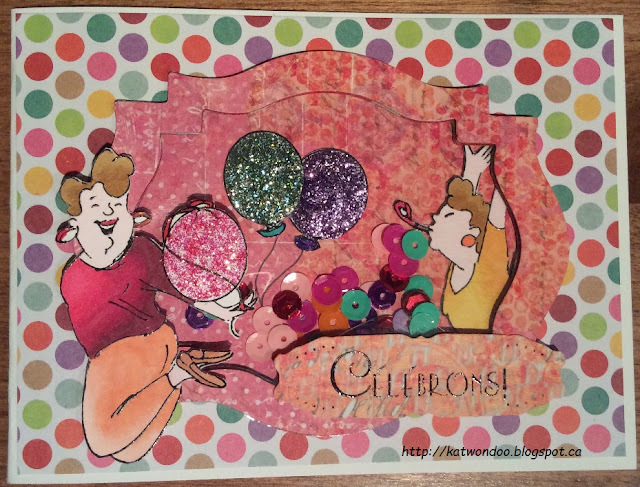 For this card, I cut out 2 ladies and the 3 balloons out of the Party Girls stamp. For more dimension, I put one lady inside the shaker and another one outside. I colored them with Spectrum Noir markers. I covered the balloons with Stickles. I put the sequins inside and closed everything. Voilà! What a fun card! Love the stickles on the balloons to add that extra sparkle. Great job!!! Ha, ha! What a fun and funny shaker card! Those ladies are having FUN! So glad you joined us to recycle/upcycle this week at Simon Says Stamp Monday Challenge! What a gorgeous party shaker card, fab colours and love those images. Super cute card! Love how you cut out the 2 gals and added them! Thanks for playing along with us over at Art Impressions! Really fun shaker card. Love the cute images. Thanks for sharing with us at Seize the Birthday.